Batching and processing is easier and more convenient with Amelia Bay’s brewed liquid extracts. Brewed liquid extracts blend quickly and easily vs. instant tea powder. Instant spray-dried powder can carry a high bacterial load and require dust protection for employees and equipment, in addition to losing valuable flavor and creating off-flavors. Brewed liquid extracts provide robust brewed flavor profiles, and they are quicker and easier than batch steeping. At Amelia Bay, we do the steeping for you. 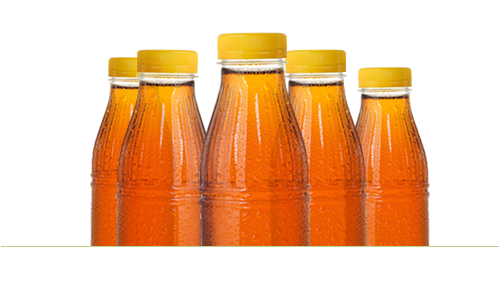 Brewed liquid extracts can be customized to meet specific product goals. Brewed liquid extracts offer batch-to-batch consistency and greater stability over the shelf life of the product vs. steeping or instant tea powders. Crystal-clear brewed RTD tea appeals to consumers, who associate powdered tea’s cloudy results with inferior quality and wet cardboard aftertaste. The pure tea taste and crystal-clear appearance of brewed tea reflect its clean label claims and functional benefits.